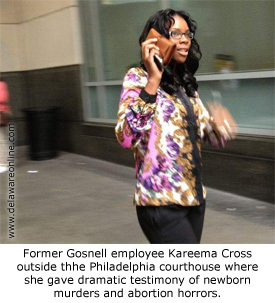 Philadelphia, PA — Kareema Cross worked for Kermit Gosnell for a harrowing four years helping with abortion procedures amid conditions so bad that she snapped photos to document them in 2008 — a year before the death of Karnamaya Mongar — then reported her boss to the authorities under a fictitious name. But no one listened. Two years later, authorities raided Gosnell’s clinic thinking it was a pill mill only to discover that it was frightfully so much more. Cross said her “training” consisted on observing one ultrasound procedure. After that she was on her own. When Cross got a measurement that was beyond 24 weeks, she would have one of the other women who were a little better at using the relique from the 1980′s to verify her findings. 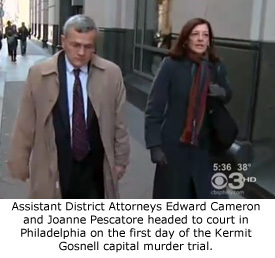 Gosnell would always redo those ultrasounds, which would all suddenly measure precisely 24.5 weeks gestation, which Gosnell mistakenly thought was the legal limit in Pennsylvania. In fact, the legal limit was 23 weeks 6 days. 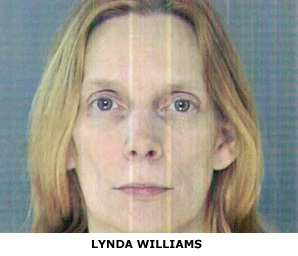 In 2009, Cross testified that another co-worker, Lynda Williams, called Cross over to see a baby that had just been born. Cross saw the baby’s chest heaving up and down in steady breathing motions. Linda reached down and lifted the baby’s hand up, but the newborn pulled it away on its own strength. Cross said she saw the baby breathing for about 20 minutes before Williams murdered the child by severing its spinal cord with scissors. Cross demonstrated again with her hands that the baby was about a foot long. Cross remained composed as she testified of observing breathing babies on more than 10 occasions. Once, she heard a whimpering cry. Ashley Baldwin, the 15-year old high school student that also helped out with the procedures, was working in the big abortion room where the crying sound originated, and sought out Cross’ help. When Cross saw the baby, she simply left the room. Pretty much everyone who worked for Gosnell administered medications without supervision even though none were qualified to do so. Several of the ladies tried to follow the sedation charts when mixing and administering sedation, but Cross noticed that Williams and another woman, Sherry West, did not while mixing drugs or when giving them to women. On occasion, some who received injections from Williams and West complained to Cross that their injections were not done properly, showing her their swollen arms. One patient was particularly memorable to Cross. Her name was Shaquana Abrams. Cross knew she worked with a friend, and after Abram’s abortion, the two kept in touch. Abrams was far advanced into her pregnancy when she came to Gosnell for a two day procedure. No one ever told why she decided to end the life of her baby. Abrams had been heavily sedated. As she lay sleeping on that filthy, torn table in the Monet room, the biggest baby Cross had ever seen in her years with Gosnell “just came out.” Cross again indicated with her hands that the baby was 12-18 inches long. His courtroom designation was Baby Boy A. The horrific photo taken by Cross seemed to overwhelm the courtroom. 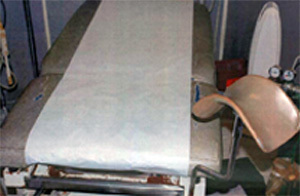 His corpse was supposed to be taken to the freezer that night, but when Jimmy Johnson came in the next morning to “take out the trash,” which included removing the abortion remains from the procedure rooms, he found the large, dark-hair baby still lying in that box in the Monet room where it had been left. Jimmy complained about his gruesome discovery, then took the baby to the basement with the rest of the human remains. Gosnell’s attitude toward her pregnancy offended Cross Wasn’t it supposed to be her choice? Sometimes Cross worked at the front desk where she would often observe Eileen O’Neill seeing patients when Gosnell was not present at the clinic. She testified that she sometimes fielded calls from insurance companies complaining about O’Neill billing for services. O’Neill had no medical license in Pennsylvania, and had allowed her temporary license in Delaware to lapse. Cross often saw O’Neill issue prescriptions on pre-signed prescription pads, just as Steven Massof did without Gosnell being present for consultation. This entry was posted on Friday, April 19th, 2013 at 5:57 pm	and is filed under Uncategorized. You can follow any responses to this entry through the RSS 2.0 feed. You can leave a response, or trackback from your own site.